Sometimes life’s left hook can really deliver a hefty punch. When we get pummeled like this day after day, it can become quite discouraging. Just ask any road warrior who needs to do a lot of travelling by plane. When you muster a smile and make other people’s day just watch small miracles happen though. And it’s those little things that make it all worth it. Just take days like today for example. I had to rearrange a lot of work and family stuff in order to make the short notice trip happen. Getting up at 3am I was greeted by a snow storm on the way to the airport. The closer I got the worse and deeper the snow got. Even the parking lot shuttle bus slipped and slid all the way to the terminal. If you have been to Philly then you know that the morning rush of folks is met by only 1 to 2 open TSA gates (there are at least 8 gates there). Even though I have TSA PreCheck card and thus usually click on that when booking flights, I was informed that a online randomizer either places the pre check on the boarding pass or it does not. Today I did not luck out at all. It took me about as long to go through the main security check line as it did to drive through the snow storm getting to the airport. Because we were the first flight out it helped getting boarded halfway on time. I had not seen this much snow lying on the wings. 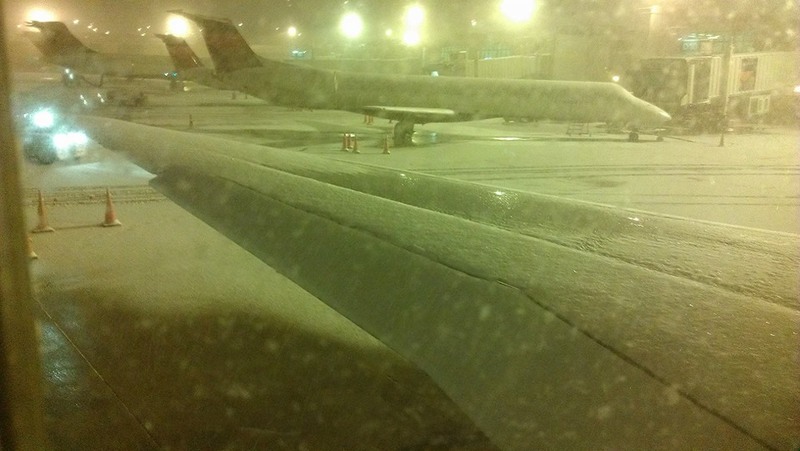 40 minutes later we took off after a thorough deicing. Of course the plane needs to “drive” about ½” at PHL airport to what feels like a ride to Camden NJ. In Philly the deicing stations are stationary instead of using mobile units. Did I mention that the plane ride was pretty rough? Getting to Detroit a meeting with a prospect turned into something completely unexpected and a lot more work will need to be done on the proposal before it can be resubmitted. The meeting that was supposed to last for quite some time was over within less than one hour. Stick with me, the good part of the story is to come. Trying to get gas for the rental car turned into a funny walk all the way around the vehicle and even a close inspection of the interior did not reveal how to open the gas door. I had to actually consult the manual to figure this out. Fascinating. Curious what the best part of the day way? Hold tight. Since the afternoon opened up I went back to the airport trying to get an earlier flight home. First I stood in the wrong line. Finally standing in the correct check in line I encountered a nice gate agent who took his time trying to check me in with the electronic check in machines. Much to his dismay, for whatever strange reason it did not let me re-book my flight with it. Then he directed me to a check in clerk. What a sweet lady. I greeted her nicely and she assisted me in getting a new ride home. She was totally hug worthy and I let her know that. Big smiles! Are you ready for the best part of my day? Well, the day needed to get a little worse before it could get better. The flight I got was supposed to leave around 3 hours earlier than the original one that I had been on. Due to more bad weather the flight ended up being delayed by about 2 hours. Oh well. I had a delightful conversation with an airline pilot. Boarding time finally rolled around and then a little gesture with a very big impact finally caught my eye: The check in agent had upgraded me from garden chair tourist class all the way in the back of the plane to new business economy class all the way up front: Zone 1! Wow, a total act of random kindness that will be with me for quite some time. All this took was to treat the check in agent with dignity and respect. All it took was a smile, and why wouldn’t we do that? Remember my friends, that most check in and gate agents for instance have very little to do with the actual flights taking off or landing on time. I can only recommend that you treat them with dignity, compassion, and empathy. Who wants to deal with grumpy people all day? They are doing that day in and day out, unfortunately. Your kindness can be like a little single snow flake setting off an avalanche of good deeds. Give that a try and watch what happens. Life will be much more bearable and dare I say can be really fun.